Scripture tells us "faith is the assurance of things hoped for, the conviction of things not seen" (Hebrews 11:1). Faith is not believing things that are contrary to reason, but above and beyond reason. The Christian faith is based on events that actually happened, from the testimony of eye-witnesses whom we believe to be trustworthy. The Resurrection of Jesus Christ from the dead is an historical fact and the chief object of the Christian faith. That is why St. Augustine writes: "It is no great thing to believe that Christ died; for this is something that is also believed by pagans and Jews and by all the wicked: everyone believes that He died. 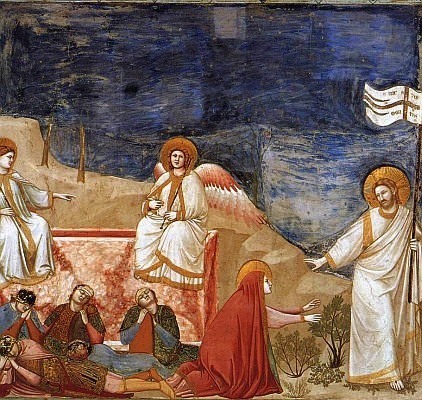 The Christians' faith is in Christ's resurrection; that is what we hold to be a great thing--to believe that He rose" ("Enarrationes in Psalmos", 120). …if Christ has not been raised, then empty too is our preaching; empty, too, your faith...and if Christ has not been raised, your faith is vain; you are still in your sins. Then those who have fallen asleep in Christ have perished. If for this life only we have hoped in Christ, we are the most pitiable people of all. But now Christ has been raised from the dead, the first-fruits of those who have fallen asleep (1Cor. 15, 13-19). The Gospel reports that it was women who were the first witnesses. This is remarkable since in first-century Palestine a woman’s testimony was considered worthless and they weren’t even able to be witnesses in a Jewish court of law. If the story was really invented why choose women to the first witnesses? The attempt by the chief priests to cover up the facts of the Resurrection only reinforced that there was an empty tomb and a missing body. They try to say that the disciples had taken the body, but St. Matthew reports earlier in his Gospel that the disciples had fled Jerusalem. These same Apostles, who a few days earlier fled in fear, would later become courageous and tireless preachers of the Resurrection after they saw Jesus, touched him and ate and drank with him. For I handed on to you as of first importance what I also received: that Christ died for our sins in accordance with the scriptures; that he was buried; that he was raised on the third day in accordance with the scriptures; that he appeared to Cephas, then to the Twelve. After that, he appeared to more than five hundred brothers at once, most of whom are still living, though some have fallen asleep. After that he appeared to James, then to all the apostles. Last of all, as to one born abnormally, he appeared to me. For I am the least of the apostles, not fit to be called an apostle, because I persecuted the church of God (1 Corinthians 15, 3-9). By his resurrection, Christ proved his Divinity. He was not simply raised, but that He rose by His own power. Jesus said: 'I lay down My life, that I may take it again ....I have power to lay it down: and I have power to take it up again' (John 10:17-18). He also told the Jewish leaders " 'Destroy this temple, and in three days I will raise it up' (John 2:19-20). When Christ rose from the dead, it was not a return to his previous earthly existence. His body appeared as it had to his disciples at the time of the Transfiguration. His body is now glorious, immortal and indestructible. Christ’s body shares in the glory he had from the beginning, when he was present with the Father before Creation. Christ's resurrection completed the work of our Redemption. By his death, Jesus freed us from sins, but by his resurrection he restored us all that we had lost through sin and opened for us the gates of eternal life (cf. Romans 4:25). The Resurrection of Jesus Christ from the dead is the source of hope for all Christians. May the Lord strengthen our faith in this central mystery of our faith. May our faith inspire us to a greater love of God and neighbor. Pray that through our deep faith in the Resurrection we may radiate this hope to others who are in despair. Fr. I think your reflection is profound, and it tells us what we believe in. I like how pragmatic you relate the passage to our duty to give hope to others. May God bless you.